A large portion of Omaha’s streets are in disrepair and not up to city standards, But while citizens have raised complaints about their neighborhood streets, city officials are mostly choosing only to repair the city’s major thoroughfares. The Omaha Public Works Department estimated that there were 350 miles of unimproved roads in the city, according to KMTV. The cost of repairing such roads is not cheap. Many of those unimproved streets were asphalt roads that were constructed before roads were supposed to be brought to city standards, according to KMTV. Due to the city not maintaining them, many are beyond repair. One group of neighbors off 113th Street found that the city had ground their street to a dirt road in 2014, the Omaha World-Herald reports. Once they realized after a while that they weren’t getting a new asphalt street, they expressed indignation to Omaha City Council. Despite the council agreeing to devote $200,000 to repave the street, the road remains unpaved. Another group of neighbors living on 95th Street encountered a similar predicament. 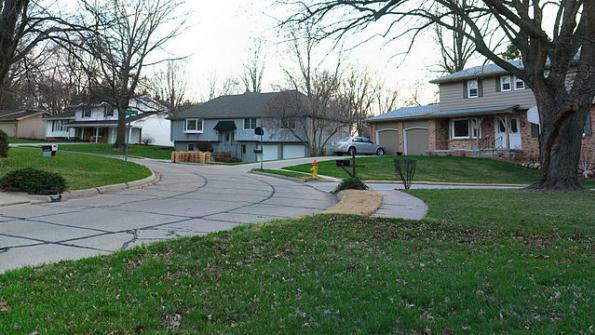 Joe Skradeski, who lives on 113th Street, likened his stretch of street to a mud puddle, and told the World-Herald that he and his neighbors are not happy about the city’s actions. “It’s not so much about my street, but it’s a policy failure,” he told the paper. These aging streets can also be hazardous to vehicles. Because the roads weren’t built to city standards and because major and minor streets alike are so prevalent throughout Omaha, the city considers the upkeep of these residential roads to be the responsibility of nearby property owners. “The developer in the past made the decision to develop the street as an asphalt overlay,” Omaha Mayor Jean Stothert told the World-Herald. “Is it the taxpayers’ responsibility today to fix that decision? Or would they rather their tax dollars go to the heavily traveled major and secondary streets? Despite the problems on residential streets, work has started to repair some of the more major streets across the city. In early March, Omaha city crews resolved nearly 90 percent of the 900 pothole claims they received in February, KETV reports. "So far in March, we've closed out more than we've opened so we're starting to reverse the trend," Omaha Public Works Street Maintenance Engineer Austin Rowser told KETV. Still, some officials stay adamant about not repairing some of the more worn-down neighborhood streets. Meanwhile, citizens like Skradeski remain angry about the situation. “Right now we’re living in misery,” he told the World-Herald.